A pretty little Karmen Ghia we saw at the park. I first developed a roll of black in white film around 1971 during a graphic arts class while in high school. The school had a pretty nice darkroom with easy access, and it was there that I really got hooked on photography. Over the years I processed film myself except when shooting color. Before digital took over the most cost effective way to deal with color was to shoot slides and have prints made of the ones you liked. There were color processing kits out there, but everyone knew that color required temperature control (Kodak specified the temperature to the tenth of a degree) and the chemicals were a bit on the nasty side. Fast forward to today and film photography has been completely buried by digital. Film is still sold, although the variety is not what it used to be, and the day of one hour processing (Remember Fotomat?) is history. Sure, in the big cities you can still get a roll of film done, but anymore most people either send it to one of a few processing houses or do it themselves. Today I processed my first roll of Portra 400 using a Unicolor C-41 processing kit I purchased from Freestyle Photographic Supplies for under $20. This is what is known as a “Press Kit” originally intended for use by photojournalists who needed to get their film processed and sent off immediately and consists of four packets of dry chemicals, a developer, a two part mix for “blix,” a combined bleach and fixer, and a packet of stabilizer. The kit I purchased makes 1 liter of each, which is exactly enough to due two rolls of 120 film. Unlike black and white processing you reuse the color chemicals, so how many rolls you can do per liter depends on a couple of factors. Once the color chemicals are mixed they start degrading. They’re sensitive to light and oxygen so they need to be stored in darkened bottles, preferably full. Also, with each use they loose some potency. The instructions with the kit are pretty vague on the capacity. While it states that one liter will do four rolls of 120, it also says that you can expect to get more depending on how you handle and store the chemicals. A little research on the internet shows some people getting 15-16 rolls of film per liter, with a storage life as long as 6 months. I’ll be doing some experimenting on my own to see how it works for me, but four rolls is the break even point for me here in Phoenix, so looks promising. The temperature required during processing is 102º F which is easy to maintain – I used warm water from the tap to fill up a cooler to act as a bath to keep everything at the right temperature. You start with a one minute was of plain water at 102º to bring the tank and film up to temperature and to was some kind of coating off the film. I was a bit surprised at the water being bright green when I drained it. This is followed by three and a half minutes of the developer at 102º, the six and a half minutes of blix anywhere from 95º to 105º, three minutes of wash and then 30 seconds to 1 minute of stabilizer. Unlike black and white processing the times are not film dependent, so any film using the C-41 process can be developed at the same time. For printing, I gave up my enlarger long ago and use an Epson V750 to scan the film, and then I can post process and print using the same workflow as I use for digital. 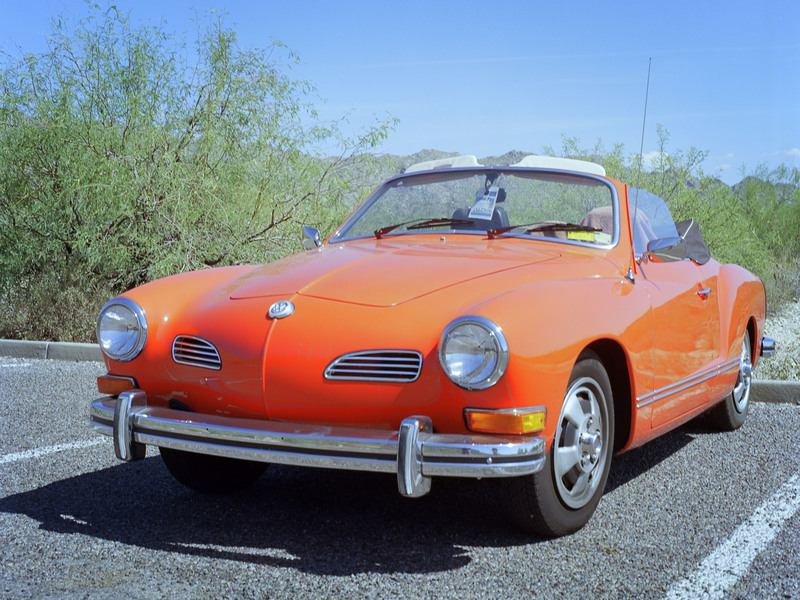 The picture of the Karmen Ghia was processed this way. Shooting film doesn’t replace digital, but I’m finding that there is something about it that digital doesn’t do. As long as the option is there, I expect I’ll do both. This entry was posted in Uncategorized and tagged C-41 processing, film on August 7, 2014 by Phil Ryan.